Flight delays, flight cancellation, flight overbooking, weather delay are some of the terms that all air travelers resent and do not wish to hear. But the fact remains that all flights do not land or depart at the scheduled hours for a variety of reasons including the weather condition, technical snags etc. According to data from the Air Transport Association, weather is responsible for as many as two-thirds of all delayed flights and just under one-third was due to technical snags and air-carrier delays. Interestingly, less than one percent of delays are due to security reasons. In the light of this information, it may be wise to avoid air travel during times of bad weather. Always assume there will be flight delays and do not book tickets too close to an important event or a business meeting. 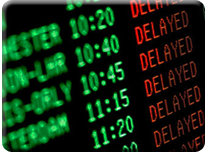 It is useful to know about some methods of tackling flight delays – more so, if you are a frequent air traveler. Try as far as possible to avoid opting for airlines and flights where delays are common. Most major airlines keep track of their on-time performance on a flight-by-flight basis. If you are not able to find the on-time performance on an airline's web site, you can contact the Bureau of Transportation Statistics that keeps a regular track of airline performance statistics. Many popular travel booking web sites and airline sites send free flight notifications to your mobile phone or as e-mail. These notifications contain exhaustive information such as flight delays, departure gate assignments and gate changes. But the hitch is most airlines often wait until the last minute to announce a delay and hence you may not be notified till you reach the airport. Another sane suggestion would be to avoid connecting flights and choose direct flights instead. A major cause of flight delays is when you miss a connecting flight. If you can not avail a non-stop flight, the Bureau of Transportation Statistics can also help you know which airports are ridden with problems. If you must inevitably choose a connecting flight, make sure you create enough time between flights to accommodate a delay. Make it a point to avoid the last flight of the day. If you are on the last flight out and if it is any chance cancelled, then you may be left with no option than to sleep at the airport or in a local hotel. Whenever possible, select a flight that leaves an hour or two prior to the last flight of the day. One thing you must do is to arrive at the airport early and immediately check in. The less time you have, the greater the risk of losing your luggage, getting an inconvenient seat or denial of boarding due to overbooking. Become aware of your rights as an air passenger as that would help when it comes to dealing with flight delays and flight disruptions. Knowing your entitlements as a delayed air traveler helps to expect and receive the treatment and relief you are entitled to. Depending on the flight distance and duration of delay, business class flights passengers are entitled to free meals and refreshments. For inordinate delays which are longer than four hours, your airline should provide you with overnight accommodation and transport to and from the airport.